the near future, we will hold a Frozen Synapse 1 tournament with some magnificient prizes and the chance for some lucky winners to grab some FS2 Beta invites! tournament - so without further ado, I'll introduce our first Frozen Synapse Map Making Contest! Prize: The winner of the map contest will receive a Frozen Synapse 2 Beta Key! As we want everyone to have the chance to participate, you can submit real/digital drawings of the map design instead of creating them with the editor. For more info on the upcoming tournament make sure to follow our announcements on Facebook, Twitter, Steam or here in the forums. If you have any questions, you can ask them here and a team member or Toma (helping out with the organization of the tournament) will answer them. We are looking forward to your interesting map ideas! I'll be lending a hand with the organization and communication surrounding the tournament (and map making contest), as I have organized a few FS tournaments in the past. If there are any questions, just ask them here and I'll reply as quickly as possible. I'll see if I can get some creative juices flowing by providing a creative example for the map making contest later on (that of course wont be eligible for the prize). Hopefully I didn't miss anything. I figure, based on the grid, that every character is maybe about 1 grid size big. Hard to visualize outside of the game. That's why I made the gridless one since I think it's easier to visualize. If your entry wins, we'll check how to incorporate it in the game, so don't worry too much about the grid size etc. The tournament is currently planned to be held late november/december, depending on the amount of players interested. We'll announce more details about it after the map making contest. Where civil blood makes civil hands unclean"
I wanted to give both houses some kind of advantage, so Team Montague (top left) has (slightly) better control of the courtyard and room designs that I feel will be harder to breach, while team Capulet (bottom right) has the balcony at the top right and easier access to the graveyard. I don't know how well I pulled either of them off, but that was the idea. Last edited by SoxxoxSmox on Tue Nov 08, 2016 7:15 pm, edited 1 time in total. Haha, yeah. I cant wait for the FS2 Beta to start. I am also really curious how the balancing on your map would turn out. Oh, don't even worry about it! It just makes it so much easier. Not really obvious, but that 2 messy bulks that crosses the screen horizontally are 'trains'. 2 boxes surrounded by cover at the middle are 'piers'. Other objects are placed at random and may be moved for balance purpose. Starting position can be Left vs Right or Up vs Down - I'd guess former would produce more interesting battle. Too many long-ranged units may stall the game unless you start demolishing things with rockets. In theory, that is. Since I do not own a copy of Frozen Synapse 1 PC(I have FS:Prime for Android tho), I have no way to test it. If there are any problems, please let me know. 1. Is standard thickness of walls(the ones shows up with randomly generated maps) 4px? 2. Do thinner-than-standard objects(or gaps) break pathfinding, look ugly, ignored or have otherwise undesirable side-effects? Signed up just to enter these. Also, my first two custom maps for FS. 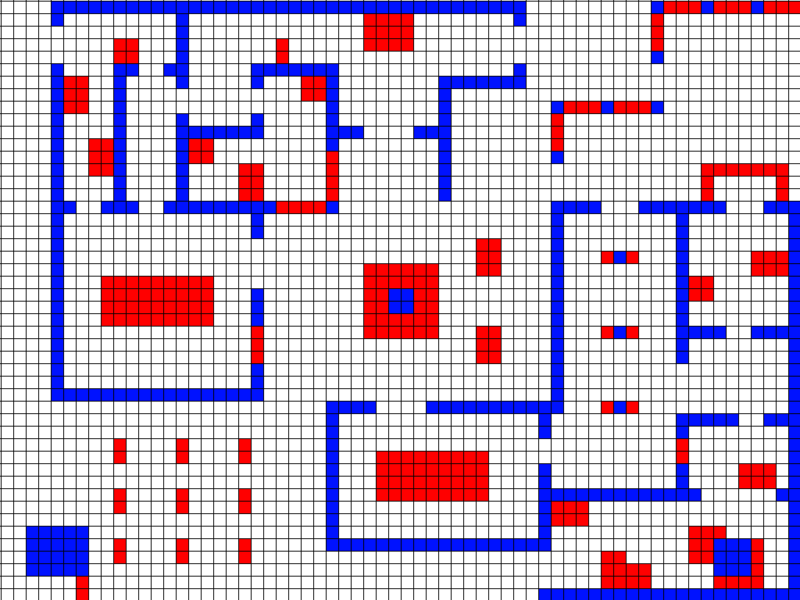 A simplistic map inspired by mazes. A more realistic map setting. Can't wait for FS2! Your map looks great! I tried to load it into Frozen Synapse and the path-finding worked flawlessly. There are some small red pixels in the middle of each train, but they are too small to be generated so it doesn't really matter. Joa7000 wrote: Your map looks great! I tried to load it into Frozen Synapse and the path-finding worked flawlessly. Just wondering, how do we test a custom map in-game? Sometimes it's hard to get an idea of the scale of things without seeing them in action. SoxxoxSmox wrote: Just wondering, how do we test a custom map in-game? Sometimes it's hard to get an idea of the scale of things without seeing them in action. When in the main menu in-game bring up the console (usually the tilde key '~'). Near the right upper corner there is an 'editor-window' menu where you have an 'import from png' option. This opens a file-browser where you can browse to the file. However, the file has to be located somewhere in the 'psychoff' install folder. I put mine in 'Frozen Synapse\psychoff\png'. It will ask you if you want to keep the existing units, plans, and triggers (which is useful when reimporting a map after editing it externally). Just say no when importing a new map. Now you are in a level editor of your map. You can edit the level, add units in the right-click menu, and give units orders. To test path-finding (it doesn't work correctly in the editor), add a unit to each team and save the map (using the upper-right menu). You MUST save the level to 'psychoff\data\userLevels' with the .enc file-extension. Go back to the main menu and chose the hotseat game type in the offline tab, and enter advanced mode. Enter the name of your level-save, e.g. 'mymap.enc' and start the game. Then you can play around with the auto-pathing and check if it works as you intended. Hope it helps. If you have any questions, just ask away. My entry: The Jet Engine! Each team starts in opposite corners. Lots of rocket launchers plz!! Guerero wrote: My entry: The Jet Engine! That is a really interesting setup as well. Wondering which map will be voted on as the tournament map.